This article discusses the culture of the People's Republic of China. See also the culture of China, culture of Hong Kong, culture of Macau and culture of Taiwan. The culture of the People's Republic of China is a rich and varied blend of traditional Chinese culture with communist and other international modern and post-modern influences. During the Cultural Revolution, an enormous number of cultural treasures of inestimable value were seriously damaged or destroyed and the practice of many arts and crafts was prohibited. Since the early 1980s, however, official repudiation of those policies has been complemented by vigorous efforts to renew China's remarkable cultural traditions. China's culture thus remains highly complex, encompassing ancient traditions and modern experiments, in what sometimes appears to be a rather dynamic but tenuous mix. The culture of People's Republic was in development long before its foundation in 1949, and is mainly a combination of traditional Chinese culture and communism. Much of the diversity of China's culture seems to come from the diversity of the Han Chinese who make up China, and the national minorities who bring individual cultural elements from their cultures, and contribute to a continuing development of Chinese culture that follows cultural changes nationwide and internationally. The culture is also very much based on the history of China which developed mainly in isolation over the hundreds of years in which it has adapted and assimilated. The ideology of the Communist and Maoist movement beginning in the twentieth century is certainly crucial to understanding modern Chinese culture. Today, China still has many close cultural links with other parts of the world, especially within East Asia, Southeast Asia and overseas Chinese community. Its cultural elements have spread across the globe due to Ancient China's influence, as well as the country's modernizing popular culture and rise as a global power, becoming one of the most prominent cultural forces in the world, and the predominant culture in Asia. For some years after the establishment of the People's Republic of China (PRC) in 1949, traditional Chinese culture was tolerated to some extent. The main changes concentrated on attempts to remove traditional social inequalities, such as sexism, ethnocentrism, and serfdom. A form of Mandarin Chinese known as Putonghua was promoted by the Central People's Government in Beijing as the lingua franca in a continuation of the Kuo-yü of the Republic of China (ROC, "Taiwan"), but the various local spoken variants and the languages of the numerous ethnic groups of China remains in use. As the Soviet Union was an ally of the PRC at the time, the culture of Russia, especially the Russian language, was quite popular; but this trend was halted when a border dispute ended the Sino-Soviet alliance in 1961—the Sino-Soviet split. When the Cultural Revolution began in 1966 all forms of traditional culture, Chinese or Western, were suppressed, including to bring an end to the Four Olds. Temples and churches were vandalized by the Red Guards; Confucian morality was frowned upon; and a cult of personality surrounding Chairman Mao Zedong was promoted. The Quotations from Chairman Mao Zedong (or the "Little Red Book") achieved sanctity equivalent to a holy text as part of Maoism, or "thoughts of Mao Zedong", which became the national ideology. Simplified Chinese ideograms were also officially introduced at the time, though many such simplified characters have existed for hundreds of years. It was in an effort to promote literacy, but has brought about a number of debates. During the later stages of the Cultural Revolution, the Criticize Lin, Criticize Confucius campaign was a political campaign started by Mao Zedong's fourth wife Jiang Qing, which lasted from 1973 to 1974 and was an extension of the then-current anti-Lin Biao campaign, used to attack the then-Premier Zhou Enlai. After the Maoist era, there has been a renaissance of traditional Chinese culture. Local religions including Buddhism, Taoism and Confucianism have flourished. These are not mutually exclusive, and many people practice a combination of the three along with elements of various folk religions. There has also been a revival of Chinese Islam and Christianity, although religious institutions remain under the control of the government. The Three-Self Patriotic Movement (TSPM) and the China Christian Council (CCC) are Protestant groups. The Chinese Patriotic Catholic Association (CCPA) and the Chinese Catholic Bishops Council (CCBC) are subordinate to the government in Beijing, instead of to the Holy See. Traditional Chinese arts have also re-emerged from the Cultural Revolution, but their developments have been hampered by the Chinese society's ready acceptance of outside cultural influences, particularly the popular culture of Hong Kong, which has a huge following inside the PRC. Nevertheless, the television stations in the PRC have in recent years produced numerous quality drama series, covering everything from imperial history to modern-day police actions, and are gaining immense popularity in mainland China. The official enforcement of the One-Child Policy has created a generation of "Little Emperors" doted upon by their parents, made more so by the development of a Western-style consumer culture within the PRC. This initially revived a sense of xenophilia among the mainland Chinese population that originated in the colonial days of the late 19th century. However, as mainland China became an economic power in its own right, the PRC government has intentionally fostered a sense of patriotic pride amongst the mainland Chinese population, which some critics see as a resurgence of Chinese nationalism. Beginning in the late 1980s and early 1990s mainland China became exposed to more western elements, notably pop culture. American cinema is popular. Young people gather late at night in bars and nightclubs. There is a growing obsession with brand names. Teen slang is incorporating western language. China has also developed a unique cell phone culture, as it has the most mobile phone users in the world; as well as being the country with the most internet users in the world. In the New Culture Movement (1917–23), literary writing style was largely replaced by the vernacular in all areas of literature. This was brought about mainly by Lu Xun (1881–1936), China's first major stylist in vernacular prose (other than the novel), and the literary reformers Hu Shi (1891–1962) and Chen Duxiu (1880–1942). The late 1920s and 1930s were years of creativity in Chinese fiction, and literary journals and societies espousing various artistic theories proliferated. Among the major writers of the period were Guo Moruo (1892–1978), a poet, historian, essayist, and critic; Mao Dun (1896–1981), the first of the novelists to emerge from the League of Left-Wing Writers and one whose work reflected the revolutionary struggle and disillusionment of the late 1920s; and Ba Jin (1904–2005), a novelist whose work was influenced by Ivan Turgenev and other Russian writers. In the 1930s Ba Jin produced a trilogy that depicted the struggle of modern youth against the age-old dominance of the Confucian family system. Comparison often is made between Jia (Family), one of the novels in the trilogy, and Hong Lou Meng. Another writer of the period was the gifted satirist and novelist Lao She (1899–1966). Many of these writers became important as administrators of artistic and literary policy after 1949. Most of those still alive during the Cultural Revolution were either purged or forced to submit to public humiliation. At the time of the Great Leap Forward, the government increased its insistence on the use of socialist realism and combined with it so-called revolutionary realism and revolutionary romanticism. Authors were permitted to write about contemporary China, as well as other times during China's modern period - as long as it was accomplished with the desired socialist revolutionary realism. Nonetheless, the political restrictions discouraged many writers. Although authors were encouraged to write, production of literature fell off to the point that in 1962 only forty-two novels were published. The arrest of Jiang Qing and the other members of the Gang of Four in 1976, and especially the reforms initiated at the Third Plenum of the Eleventh National Party Congress Central Committee in December 1978, led more and more older writers and some younger writers to take up their pens again. Much of the literature discussed the serious abuses of power that had taken place at both the national and the local levels during the Cultural Revolution. The writers decried the waste of time and talent during that decade and bemoaned abuses that had held China back. At the same time, the writers expressed eagerness to make a contribution to building Chinese society. This literature, often called "the literature of the wounded," contained some disquieting views of the party and the political system. Intensely patriotic, these authors wrote cynically of the political leadership that gave rise to the extreme chaos and disorder of the Cultural Revolution. Some of them extended the blame to the entire generation of leaders and to the political system itself. The political authorities were faced with a serious problem: how could they encourage writers to criticize and discredit the abuses of the Cultural Revolution without allowing that criticism to go beyond what they considered tolerable limits. It is not surprising that such dramatic change brought objections from some leaders in government and literary and art circles, who feared it was happening too fast. The first reaction came in 1980 with calls to combat "bourgeois liberalism," a campaign that was repeated in 1981. These two difficult periods were followed by the campaign against spiritual pollution in late 1983, but by 1986 writers were again enjoying greater creative freedom (see Chinese intellectualism). Traditional drama, often called "Chinese opera," grew out of the zaju (variety plays) of the Yuan dynasty (1279–1368) and continues to exist in 368 different forms, the best known of which is Beijing Opera, which assumed its present form in the mid-nineteenth century and was extremely popular in the Qing dynasty (1644–1911) court. In Beijing Opera, traditional Chinese string instrument and percussion instruments provide a strong rhythmic accompaniment to the acting. The acting is based on allusion: gestures, footwork, and other body movements express such actions as riding a horse, rowing a boat, or opening a door. Spoken dialogue is divided into recitative and Beijing colloquial speech, the former employed by serious characters and the latter by young females and clowns. Character roles are strictly defined. The traditional repertoire of Beijing Opera includes more than 1,000 works, mostly taken from historical novels about political and military struggles. In traditional Chinese theater, no plays were performed in the vernacular or without singing. But at the turn of the twentieth century, Chinese students returning from abroad began to experiment with Western plays. Following the May Fourth Movement of 1919, a number of Western plays were staged in China, and Chinese playwrights began to imitate this form. The most notable of the new-style playwrights was Cao Yu (1910–1996). His major works - "Thunderstorm," "Sunrise," "Wilderness," and "Peking Man" - written between 1934 and 1940, have been widely read in China. In the 1930s, theatrical productions performed by traveling Red Army cultural troupes in Communist-controlled areas were consciously used to promote party goals and political philosophy. By the 1940s theater was well established in the Communist-controlled areas. Following the Cultural Revolution, Western-style theater experienced a revival. Many new works appeared, and revised and banned plays from China and abroad were reinstated in the national repertoire. Many of the new plays strained at the limits of creative freedom and were alternately commended and condemned, depending on the political atmosphere. One of the most outspoken of the new breed of playwrights was Sha Yexin. His controversial play If I Were for Real, which dealt harshly with the cronyism and perquisites accorded party members, was first produced in 1979. In early 1980 the play was roundly criticized by Secretary General Hu Yaobang - the first public intervention in the arts since the Cultural Revolution. In the campaign against bourgeois liberalism in 1981 and the anti-spiritual pollution campaign in 1983, Sha and his works were again criticized. Through it all Sha continued to write for the stage and to defend himself and his works in the press. In late 1985 Sha Yexin was accepted into the Chinese Communist Party and appointed head of the Shanghai People's Art Theater, where he continued to produce controversial plays. "The Red Sun" Album featuring young Mao Zedong on the cover. A Guoyue theme album. Chinese music appears to date back to the dawn of Chinese civilization, and documents and artifacts provide evidence of a well-developed musical culture as early as the Zhou dynasty (1027- 221 BCE). The Imperial Music Bureau, first established in the Qin dynasty (221-207 BCE), was greatly expanded under the Han emperor Wu Di (140-87 BCE) and charged with supervising court music and military music and determining what folk music would be officially recognized. In subsequent dynasties, the development of Chinese music was strongly influenced by foreign music, especially that of Central Asia. The New Culture Movement of the 1910s and 1920s evoked a great deal of lasting interest in Western music as a number of Chinese musicians who had studied abroad returned to perform Western classical music and to compose works of their own based on the Western musical notation system. Symphony orchestras were formed in most major cities and performed to a wide audience in the concert halls and on radio. Popular music - greatly influenced by Western music, especially that of the United States - also gained a wide audience in the 1940s. After the 1942 Yan'an Forum on Literature and Art, a large-scale campaign was launched in the Communist-controlled areas to adapt folk music to create revolutionary songs to educate the largely illiterate rural population on party goals. 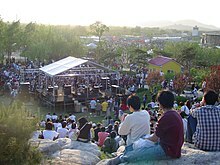 A performance at the 2007 Midi Modern Music Festival in Beijing. The Legendary Four is a group of four composers—Tan Dun, Ye Xiaogang, Guo Wenjing, and Qu Xiaosong—who studied composition at the same time in the Central Conservatory of Music at Beijing during the Chinese Cultural Revolution. In the beginning of the revolution, they were all required to leave home and work on farms, where they gathered incomparable compositional experiences through the influences of traditional Chinese folk music. In imperial times, painting and calligraphy were the most highly appreciated arts in court circles and were produced almost exclusively by amateurs - aristocrats and scholar-officials - who alone had the leisure to perfect the technique and sensibility necessary for great brushwork. Calligraphy was thought to be the highest and purest form of painting. The implements were the brush pen, made of animal hair, and black inks made from pine soot and animal glue. In ancient times, writing, as well as painting, was done on silk. But after the invention of paper in the first century CE, silk was gradually replaced by the new and cheaper material. Original writings by famous calligraphers have been greatly valued throughout China's history and are mounted on scrolls and hung on walls in the same way that paintings are. Beginning in the Tang dynasty (CE 618-907), the primary subject matter of painting was the landscape, known as shanshui (mountain-water) painting. In these landscapes, usually monochromatic and sparse, the purpose was not to reproduce exactly the appearance of nature but rather to grasp an emotion or atmosphere so as to catch the "rhythm" of nature. In Song dynasty (960-1279) times, landscapes of more subtle expression appeared; immeasurable distances were conveyed through the use of blurred outlines, mountain contours disappearing into the mist, and impressionistic treatment of natural phenomena. Emphasis was placed on the spiritual qualities of the painting and on the ability of the artist to reveal the inner harmony of man and nature, as perceived according to Taoist and Buddhist concepts (see Hundred Schools of Thought). Beginning in the thirteenth century, there developed a tradition of painting simple subjects - a branch with fruit, a few flowers, or one or two horses. Narrative painting, with a wider color range and a much busier composition than the Song painting, was immensely popular at the time of the Ming dynasty (1368–1644). Motion pictures were introduced to China in 1896, but the film industry was not started until 1917. During the 1920s film technicians from the United States trained Chinese technicians in Shanghai, an early filmmaking center, and American influence continued to be felt there for the next two decades. In the 1930s and 1940s, several socially and politically important films were produced. The film industry continued to develop after 1949. In the 17 years between the founding of the People's Republic and the Cultural Revolution, 603 feature films and 8,342 reels of documentaries and newsreels were produced. The first wide-screen film was produced in 1960. Animated films using a variety of folk arts, such as papercuts, shadow plays, puppetry, and traditional paintings, also were very popular for entertaining and educating children. During the Cultural Revolution, the film industry was severely restricted. Most previous films were banned, and only a few new ones were produced. In the years immediately following the Cultural Revolution, the film industry again flourished as a medium of popular entertainment. Domestically produced films played to large audiences, and tickets for foreign film festivals sold quickly. Radio and television expanded rapidly in the 1980s as important means of mass communication and popular entertainment (see Communications in China). By 1985 radio reached 75 percent of the population through 167 radio stations, 215 million radios, and a vast wired loudspeaker system. Television, growing at an even more rapid rate, reached two-thirds of the population through more than 104 stations (up from 52 in 1984 and 44 in 1983); an estimated 85 percent of the urban population had access to television. As radio and television stations grew, the content of the programming changed drastically from the political lectures and statistical lists of the previous period. Typical radio listening included soap operas based on popular novels and a variety of Chinese and foreign music. Most television shows were entertainment, including feature films, sports, drama, music, dance, and children's programming. In 1985 a survey of a typical week of television programming made by the Shanghai publication Wuxiandian Yu Dianshi (Journal of Radio and Television) revealed that more than half of the programming could be termed entertainment; education made up 24 percent of the remainder of the programming and news 15 percent. A wide cross section of international news was presented each evening. Most news broadcasts had been borrowed from foreign news organizations, and a Chinese summary was dubbed over. China Central Television also contracted with several foreign broadcasters for entertainment programs. Between 1982 and 1985, six United States television companies signed agreements to provide American programs to China. Chinese television scene has also proven to be a hot spot in today's popular culture (similar to K-dramas), with well received Chinese television dramas such as Princess Agents, Nirvana in Fire, The Journey of Flower, Eternal Love, The Princess Weiyoung, Just One Smile Is Very Alluring, The Legend of Mi Yue, Scarlet Heart, General and I and more garnering billions of views among China's most popular video websites, iQiyi, Youku, QQ Video and Le Video. Some dramas have been so popular and widely acclaimed internationally that they were remade into different languages, as well as spinning off with sequels. Chinese variety scene has also became widely successful with popular shows such as Happy Camp, Super Voice Girl, Sing! China, The Rap of China, The Singer, and more gaining worldwide recognition, garnering from millions to billions of viewership and winning numerous awards. Variety arts, including tightrope walking, acrobatics, animal acts, and sleight of hand date back at least as far as the Han dynasty (206 BCE-CE 220) and were very popular in the imperial court. Later, many of these feats were incorporated into the traditional theater, and they continued to be performed by itinerant troupes. As these troupes traveled around the countryside, they developed and enriched their repertoire. Since 1949 these art forms have gained new respectability. Troupes have been established in the provinces, autonomous regions, and special municipalities, and theaters specifically dedicated to the variety arts have been built in major cities. Some troupes have become world-famous, playing to packed houses at home and on foreign tours. Stand-up comedy is an emerging art form. At least until 2008, China blocked access to Comedy Central's website, deeming the website unsuitable for China's citizens. Hong Kong is the only city in China to offer a full-time comedy club, where both English and Cantonese speaking comedians perform. Each October, Hong Kong hosts an annual comedy festival, the HK International Comedy Festival. Publishing in China dates from the invention of woodblock printing around the eighth century CE and was greatly expanded with the invention of movable clay type in the eleventh century. From the tenth to the twelfth century, Kaifeng, Meishan, Hangzhou, and Jianyang were major printing centers. In the nineteenth century, China acquired movable lead type and photogravure printing plates and entered the age of modern book and magazine printing. The largest of the early publishing houses were the Commercial Press (Shangwu Yinshuguan), established in 1897, and the China Publishing House (Zhonghua Shuju), established in 1912, both of which were still operating in 1987. Following the May Fourth Movement of 1919, publishers, especially those associated with various groups of intellectuals, proliferated. During the Chinese civil war, New China Booksellers (Xinhua Shudian) published a large amount of Marxist literature and educational materials in the communist-controlled areas. On the eve of the establishment of the People's Republic in 1949, there were over 700 New China Booksellers offices. Between 1949 and 1952, the New China Booksellers offices scattered throughout the country were nationalized and given responsibility publishing, printing, and distribution. Also, several small private publishers were brought under joint state/private ownership, and by 1956 all private publishers had been nationalized. After a brief flourishing during the Hundred Flowers Campaign of 1956-57, the publishing industry came under strong political pressure in the Anti-Rightist Campaign of 1957. The industry had not fully recovered from this campaign when it was plunged into the Cultural Revolution, a period in which publishing was severely curtailed and limited mainly to political tracts supporting various campaigns. Following the Cultural Revolution, publishing again flourished in unprecedented ways. In 1982 the China National Publishing Administration, the umbrella organization of Chinese publishers, was placed under the Ministry of Culture, but actual management of the industry was directed through four systems of administration: direct state administration; administration by committees or organizations of the State Council or the party Central Committee; armed forces administration; and administration by provinces, autonomous regions, or special municipalities. In fall of 2013, the government of China announced that they were admitting foreign game companies to sell their games in China. In 2000, the CPC government banned people in China from selling stationary type home game machines made by foreign companies because the government thought the game machines were harmful to young people. However, one year after the ban, online games became popular and the game problem of young people was not solved. In addition, Nintendo cooperated with Wei Yen to sell iQue Player which can play Nintendo 64 games in China legally. On the other hand, underground video game copies prevailed. For example, Wii consoles were copied and sold as Vii. PS3s were also copied. As a result, the regulation did not make sense. The CPC government canceled temporarily the sales prohibition measures of the foreign-made-goods game machines which had continued over the past 14 years. Thereby, business opportunity was born to the game machine maker. However, many dealers were adopting unlicensed software forcing each company to fight with an illegal copy first. In addition, many Chinese consumers like the free game in a personal computer or a personal digital assistant, so this also becomes a barrier with which each company advances to the market. The reaction to as opposed to the removal of the ban on the China game market varies by company. For example, Sony's PlayStation is excellent in security compared with a competition model, and since illegal software-oriented reconstruction is comparatively difficult, an infringement problem is not a threat so much to the business of the company. It has been suggested that a console company could find a niche if it catered to users of unauthorized video game copies. Nevertheless, the press officer of Sony Computer Entertainment only commented "it is recognized as the Chinese market being promising, and for possibility succeedingly." Microsoft has not mentioned concrete plans about the China game machine market, either. On the other hand, it was said to Reuters that there is no plan for the press officer of Nintendo to advance to the Chinese market. The game market in China is the 3rd in the world which ranks next to the U.S. and Japan, and is an attractive market for each company. Yomiuri picks up on Sony and only estimates that many Chinese people will buy games of Sony. However, Asahi, picks up Sony too, says that it is difficult for Sony to sell their games in China, because there is a lot of games what is copied illegally and it is likely to be censored by government of China and happen competition between game　companies. Zaikei Shimbun says about Sony and Microsoft, and says that this two companies will not able to benefit in China, because of response of government and the current situation of China. Reuter picks up on Nintendo and says that Nintendo will release a new game for developing countries, including China. According to this article, Nintendo will sell their game in a new way that another game companies had not use yet. Unlike other many articles, this article implies that Nintendo will able to benefit in China. Yahoo news, like Yomiuri, does not say about many obstacles for game companies. Nikkei’s article was written when selling games was not deregulated, but it was written the reason why government of China regulated something, why they considered deregulation, and what process they needed to deregulate about selling games. It was also written that what will be happen in the game industry after they deregulate about selling games and will Sony, Microsoft, and Nintendo be able to benefit from selling their games. Like this, each media have various opinions. So, it is important that we consider many facts and recognize what is true fact. On April 16, 2014, Sony Computer Entertainment publicized their sales figures. According to them, they had sold seven million PlayStation 4 consoles in China, as well as 20 million pieces of game software. Microsoft revealed that they had sold three million Xbox One consoles as of 2013. (7) Nintendo revealed that they had sold sixteen million Nintendo 3DS and Wii U consoles. A Chinese portal site, NetEase, did a questionnaire survey. People were asked which game console they want to buy after the deregulation. PS4, PS Vita, Xbox One and so on were included in the choices. Until July 15, 2014, 6488 people had given answer to this question, and PS4 was selected by more than a half of them. The number of those who had chosen Xbox One was about presumably 640, only 10 percent of all. Nintendo was not mentioned. According to the article written by Forbes, stock price of Sony and Nintendo rose in Japan after China had declare the deregulation. This means people expected that these two companies will succeed in China. Microsoft stock also rose, but far lower. These two companies have been stronger than Microsoft in Asia. Therefore, in the future we may see Sony and Nintendo compete intensively in China. Judging from these information, Sony seems to win Microsoft, perhaps and Nintendo, in the video game market, both of the world and China. However, the situation is not so simple. There are some concern for game companies. First, PRC government officially said that the deregulation is temporary; in other words selling games will be banned again someday. Second, if game companies want to sell their products, they must produce in free-trade zone in Shanghai and foreign companies’ games will have to undergo strict censorship by PRC government. ^ "The Rise of China's Soft Power | Belfer Center for Science and International Affairs". www.belfercenter.org. ^ a b "Stand-up comedy around the world: a glance at China's and Africa's scenes". Punchline Magazine. 2008-07-14. Archived from the original on 2012-05-25. Retrieved 2008-08-20. ^ Kurihara, M. (2014, May 26). Chūgoku de pureste hanbai e sonī genchi de goubengaisya (Sony will sell “Play Station” in China), Yomiuri Shimbun, p. 3. ^ Saito, T. (2014, May 27). Sonī chūgoku de pureste kateiyoukaikin uke kakusya sannyū (Game companies, including Sony, will sell their games in China), Asahi Shimbun, p. 1. ^ Sony to Microsoft no gemuki, chūgoku deno rieki soshutsu ha konnan ka (It may be difficult for Sony and Microsoft to sell their games and to benefit). (2014, May 20). Zaikei Shimbun. Retrieved: http://www.zaikei.co.jp/article/20140520/194332.html [May 27, 2014]. ^ Nintendo, rainen nimo shinkokoku you no gemuki wo tonyu (Nintendo plans to sell new video games in developing countries next year). (2014, May 8). Reuter. Retrieved: http://jp.reuters.com/article/topNews/idJPKBN0DO0AX20140508 [May 27, 2014]. ^ Ide, S. (2014, May 26). Pureste chūgoku de hannbai e “PS4” ka(“Play Station” will be sold in China), Mainichi Shimbun. Retrieved: "Archived copy". Archived from the original on 2014-09-03. Retrieved 2014-08-28. CS1 maint: Archived copy as title (link) [July 18, 2014]. ^ Tassi, P. (2013, February 7). Sonī to nintendo ni kouki ka chūgoku de gēmuki kaikin no kansoku(Government of China may deregulate about selling games), Nikeei Shimbun. Retrieved: http://www.nikkei.com/article/DGXNASFK0503J_V00C13A2000000/ [July 18, 2014]. ^ Tassi, P. (2013, January 28). Nintendo, Sony thrilled as china considers lifting 12 year ban on console sales, Forbes. Retrieved: https://www.forbes.com/sites/insertcoin/2013/01/28/nintendo-sony-thrilled-as-china-considers-lifting-12-year-ban-on-consoles/ [July 18, 2014]. ^ PS4 vs Xbox One, chūgoku deno maehyōban ha Sony ga attōteki yūi(PS4 vs Xbox One, Sony has much greater advance reviews than Microsoft). (2014, July 17).Yahoo Japan. Retrieved: "Archived copy". Archived from the original on 2014-09-03. Retrieved 2014-08-28. CS1 maint: Archived copy as title (link) [July 17, 2014]. ^ [FT]Chūgoku, gaikokusei gēmuki hanbai wo 14nennburini kaikinn(China deregulate the foreign games first time in 14 years). (2014, January 8). Nihon Keizai Shimbun. Retrieved: http://www.nikkei.com/article/DGXNASGV08002_Y4A100C1000000/ [July 18, 2014]. International Dunhuang Project — an international collaboration to make more than 100,000 manuscripts, paintings and artifacts from Dunhuang and other Silk Road sites available on Internet. Items are shown in context, with bibliographies, maps, photographs, site plans and other information relating to their provenance, history and present condition.